What a line up and congratulations to Nesta for pulling of a political success in their Innovation Edge conference this week – the Royal Festival Hall, an audience of three thousand and the inventor of the web. Pretty cool. But by far the coolest man of the day was Bob Geldof. Labelling himself one of what George Bernard Shaw called an ‘unreasonable man’, he talked about how this quality was one of the key factors in defining the entrepreneur. I was seriously impressed by his speech, delivered whilst pacing the stage in a fabulous mix of pin stripe tailoring and confrontational honesty. 30 minutes, no notes and total conviction and charm. Be asked what I thought were the best questions of the day – if innovation is about progress, then progress to what? More? More what? More of Everything? We can’t have more of everything, we need to rearrange things. So, how can innovation help us to solve the huge global problems and challenges that we all face. There is a global interdependence that must be dealt with my cooperation. He defined cooperation as the paradigm for this century and called upon us, Nesta and the government to show commitment and boldness without fear of failure. This was great stuff and a slightly more subtle message then the one given by Gordon Brown which defined the need for innovation as one of the keys to the UK success competitively in the global economy. Nesta’s job, I hope, is to walk the line between these two positions and so far, they are going a pretty good job. Their Chairman Chris Powell talked about innovation as being tranformative, iterative and geared to demand. I hope that they continue to see the demand being for cooperation and humanitarianism and not get sucked into the view that innovation is simply a route for profit (a position well versed by those who work in the creative and visual arts). Maybe the real risk taking we need now is to place cooperation alongside profit and believe that we are simply better and greater by working together. This is what I believe the web can help us to do. 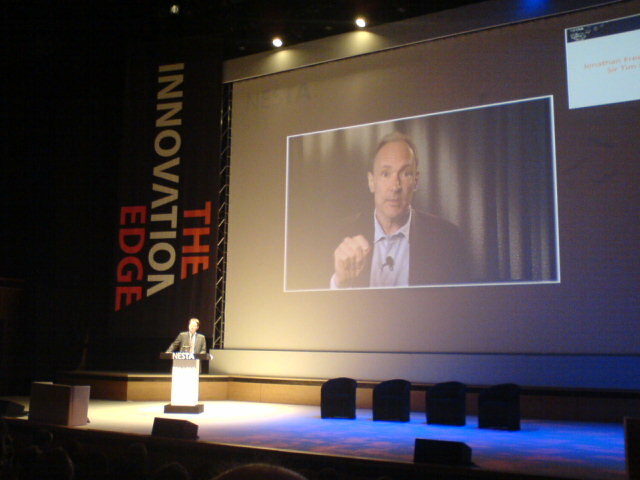 Tim Berners-Lee echoed this view in his address (via a video link from Bristol). Speaking with a very English modestly of the part he played in developing the web he said the tool that does not represent the interconnection of millions of bits of computer equipment – but is the vehicle for “Humanity Connected”. When asked by journalist Jonathon Freedland what his hope for the web, he said it was to “be responsible” and in shaping our research and new ideas, we would ask ourselves both the scientific question of ‘what is true’ but also the democratic one of ‘what shall we do’. Only then will be begin to see how to balance the ecology and psychology of the web. Going to be joining colleagues from Collections Trust, Becta, JISC, The European Library and Nicholas Copernicus University, Poland to talk about the different perspectives and thoughts around how people find and discovery cultural resources online. The event is at RIBA on May 23rd.